French niche line Memo has launched Marfa, a new unisex fragrance inspired by quirky art town Marfa, Texas (and see also: DS & Durga El Cosmico). Let Memo’s spellbinding Marfa Eau de Parfum take you on a journey… your eyes riveted on the sky, the desert is forgotten. Tuberose is your star and your shepherd. There will be mystery, the infinite hidden behind the decor, silence beneath the cacti. As the Milky Way blazes an azure trail, you fly by so quickly; the road, half-cedar, half-sandalwood, rises before you. Notes of orange blossom absolute, tuberose absolute and white musk are the heady and addictive notes to create your storybook. Marfa: your theatre, your poem, your creation, your invention. 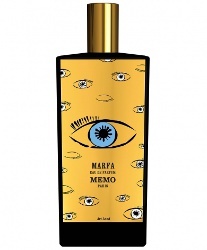 Memo Marfa is available now at Harvey Nichols in the UK, £175 for 75 ml Eau de Parfum. Someone’s been reading my Prix de Faux journal. Oh man that Inle Iris is so so good. But I just couldn’t cross that $ line in the sand. I love West Texas and I keep hoping one of these Marfa perfumes will actually remind me of it (or that ANY desert-inspired perfume will remind me of the desert)–doesn’t sound like this one is trying too hard, I haven’t yet sniffed a tuberose or sandalwood tree in Big Bend. That moment of cool air and wet earth when you walk into a canyon that has water? Mmm. That’s what I missed when I lived in the Pacific Northwest — that sense of a wet place being something special, with its own scent, its own vegetation. Have you tried Oriza Legrand Chypre Mousse? It is vegetal and damp and just plain weird. My thoughts exactly! I lived in West Texas for six years and never saw an orange tree, much less orange blossoms, lol. I had a quick sniff of this the other day at Bergdorfs and liked it better than I expected considering it contains tuberose (I don’t like tuberose). I didn’t spend enough time with it to give a proper analysis but it did impress me.